Usually, starting with the worst point is not how one would begin a review – but this great book so far only exists in a German version, and it will probably take a bit of time until French and English versions will be available. Still, it will be worth the wait. Three authors, Dominic Johnson, Simone Schlindwein, and Bianca Schmolze have teamed up throughout the past couple of years and taken the unprecedented trial of Germany-based FDLR masterminds Ignace Murwanashyaka and Straton Musoni as an opportunity to pin down a comprehensive history of post-genocide Rwandan Hutu mobilisation in eastern Congo. Both from a journalistic and academic point of view, this was utterly necessary. Despite the fact that FDLR remains the largest durable and centralised armed movement in eastern Congo – a pattern that may just change now with the group’s recent splits – writing on the FDLR have been a scarce commodity. Great Lakes followers have been thankful to the outstanding works of Rakiya Omaar, Raymond Debelle, and a few others – as well as a fair amount of grey literature and local research. All of that is well reflected in “Tatort Kongo”. The book’s perhaps biggest strength is that the authors manage to describe and analyse the internal logics of a brutal militia all through its international leadership and down the hierarchy to the very local levels of individual companies and combatants. And in doing so, it finds a balance between explaining the FDLR’s world views, telling personal stories of (ex-)combatants and, on the other since, meticulously unfolding the cruelty that commands numerous of the groups operations, such as the massacres of Busurungi and Luvungi. In taking turns between the German courtrooms and the Kivutien forests, the authors moreover find an excellent way to express how close the relation between geographically remote events has become in 21st century (civil) wars. Drawing from an impressive array of personal archives, interviews, and experts that have investigated the FDLR’s trajectory in the past two decades, Johnson, Schlindwein, and Schmolze link a dense puzzle of historical and correlated events. In an area where rumours are notoriously ripe, they manage to discern facts from fiction – sometimes in more convincing way than the German court ruling over FDLR’s leadership. Only through the last bits of recent FDLR history in late 2015 and early 2016 – certainly due to submission deadlines – the readers can find a few more generalising and unconfirmed bits of analysis. On the other side, though, the book is perhaps the richest collection of first-hand evidence from thousands of court protocols to an unending array of communication transcripts of the group and rare original documents. What are the opportunities and limitations of international justice? What types of mass crimes can be meaningfully judged by courts far away from the crime scene? How can Western courts, after all, make sense of local crime contexts whose logics they hardly understand? What can possibly go wrong in such trials? What is the role of local/national justice and that of international jurisdiction? How does all that relate to peace and stability in the larger sense, to human security and reconciliation more narrowly? Johnson, Schlindwein, and Schmolze don’t provide final answers to all of these but they ask the right questions and, along the case of FDLR, point us towards important debates yet to come. The International Criminal Court has just specified the sentence of Jean-Pierre Bemba, a former vice-president of the DRC convicted for his role in countering François Bozizé’s coup d’état against Ange-Felix Patassé. The same court failed to open the main trial against Callixte Mbarushimana, the most influential Europe-based FDLR cadre since Murwanashyaka’s conviction, and seeks to get hold of Sylvestre Mudacumura, the FDLR’s nominal military commander. At the same time, this court has always faced allegations of ‘only hunting down Africans’ – basically because many non-African countries have never adhered to the Rome Statute that forms the legal basis for the ICC to operate. 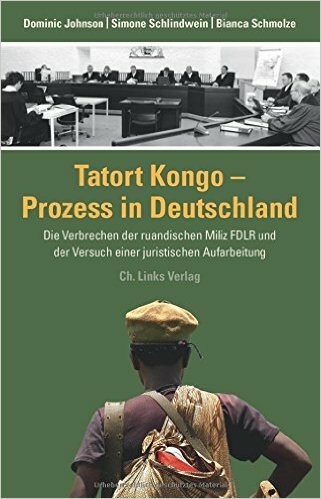 “Tatort Kongo”, that also takes stock of two other related trials in Germany – in Frankfurt a former Rwandan mayor was convicted for participating in the 1994 Genocide and in Duesseldorf three exiled Rwandans sat trial for supporting the FDLR form abroad – is a comprehensive account not only of the FDLR’s history in eastern Congo, and the trial of its senior leadership in Germany. It is also a tale of international intervention into violent conflict, of trying to keep the peace and to make justice. On 450 pages, this book convincingly shows why all that is so incredibly difficult. Scholars, professionals, and journalist working in/on the region may learn German or team up to help making possible a quick and good translation. Beat Saréboum is a consultant and writer on politics, development, and justice in Africa. His real name is different to this pseudonyme.